Be the first to share your favorite memory, photo or story of Mildred "Millie". This memorial page is dedicated for family, friends and future generations to celebrate the life of their loved one. 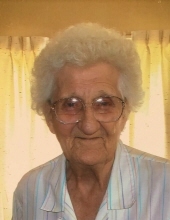 Mildred "Millie" E. Stamberger, 96 of Mendota passed away February 8, 2019 in the Mendota Lutheran Home. Visitation will be 10:00 until 11:00 on Wednesday morning February 13, 2019, with a service at 11:00, all in Schwarz Funeral Home. Rev. Susan Presley will officiate, and burial will follow in Restland Memorial Gardens Cemetery. Millie was born August 10, 1922 in Nachusa, Illinois to Edward and Rose (Nickel) Olsen. She attended Mendota High School. On November 28, 1945 she married Wayne Stamberger Sr. at Clarion Evangelical Lutheran Church. During her work career Millie was in the shop of Heico until her retirement in 1984. During the summer she enjoyed visiting at the Mendota Farmers Market where she sold her delicious beer mustard. Survivors include son: Wayne (Kathi) Stamberger Jr. of LaMoille; 3 grandchildren: Brian (Amanda) Stamberger of Mendota and Jason (Shelly) Stamberger of Mendota, and Tracy Wright of Princeton; 7 great grandchildren: Blake, Trent, Dominik, Ashtyn, Harper, Gavin and Jaxon Stamberger., and one sister: June (Don) Kofoid of Mendota. She is preceded in death by: husband Wayne on 4/21/2009, parents, 4 sisters and 3 brothers. Pallbearers will be: Dave, Ed, Harold and Tom Olsen, Charlie and Mike Smith. Memorials may be directed to the Mendota Lutheran Home or M.A.S.S. (Mendota Area Senior Services). To send flowers or a remembrance gift to the family of Mildred "Millie" E. Stamberger, please visit our Tribute Store. "Email Address" would like to share the life celebration of Mildred "Millie" E. Stamberger. Click on the "link" to go to share a favorite memory or leave a condolence message for the family.